Self Determined Admission: We just ask for a donation in JCBA’s Donation Box. It’s time to get those holiday cards in the mail! Come and join us for a festive social to get the task started (or even tackled). In this holiday variation of our ever popular Real Mail Fridays Letter Writing Socials, we are opening our gallery doors for you and we’re providing the festive music, cookies, coffee and tea, and good friends, too. You bring your postage stamps and your address book and your Christmas cards, your Hanukkah cards, your New Year cards––whatever holiday cards you send. There’ll be lots of papers and pens and art supplies on hand to help make your cards even more festive. We’ll also have a few of your favorite Makers Marketplace vendors here to help your holiday shopping along. Come when you can and leave when you must, and expect a delightful afternoon… the kind where you’re dreaming of a white Christmas with every Christmas card you write. EXPANDED HOURS! 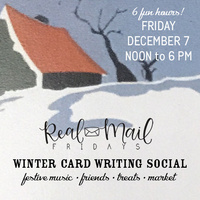 To help you get all those cards written, we’re starting this Real Mail Fridays event at noon, rather than 2, and continuing all the way until the library closes at 6. And don’t forget to bring your own stamps for this Real Mail Friday! Andrew Carroll is collecting thousands of war letters written during periods of conflict and is building an archive for them at Chapman University. Included in The Million Letter Project is a letter written from a ship at Pearl Harbor while the bombs were dropping, and another letter from the Revolutionary War. He invites the public to donate their letters to the archive. Come hear about the project in this informal talk held at the JCBA Bindery in the 5:00 hour of this very special Real Mail Fridays Social.